I’ll start this post off with a warning: If you are not a fan of raw meat, and are one of those people that prefers not thinking about how your steak once moo’ed… this is not your post. Sorry. One of our favorite things down here is shopping for meat. 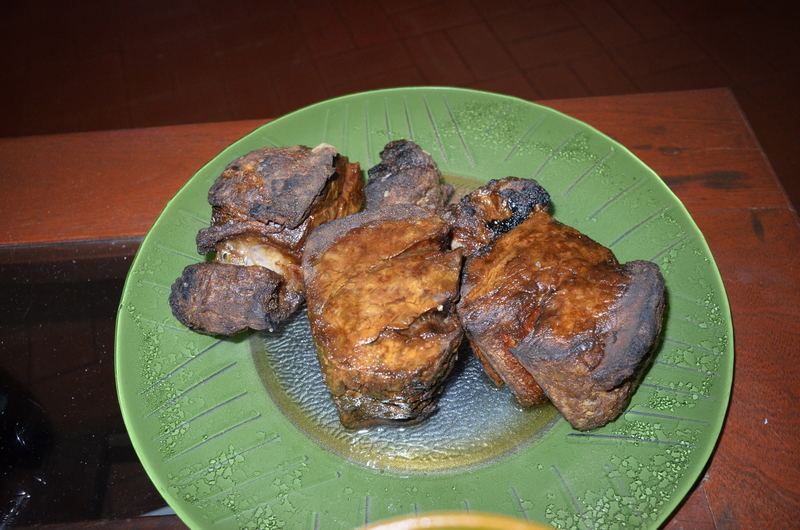 Unlike in the United States, there are virtually no prepackaged cuts of steaks or pork chops or what have you. 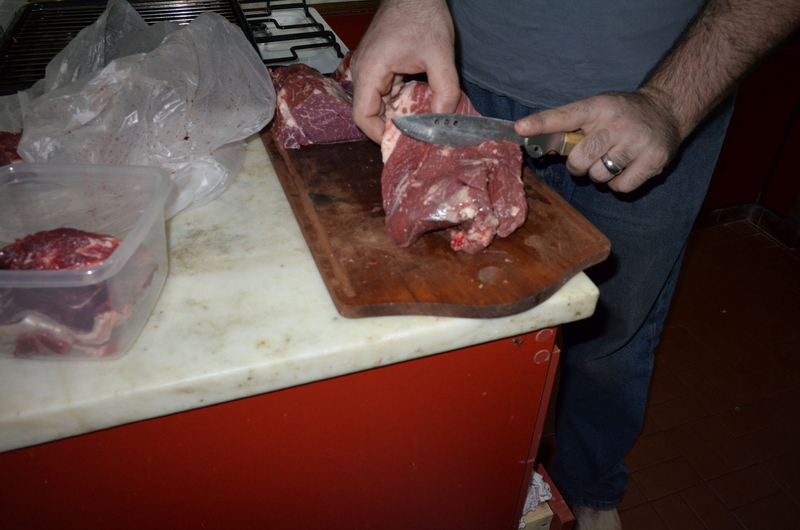 Instead, you make friends with your neighborhood butcher, or carniceria. 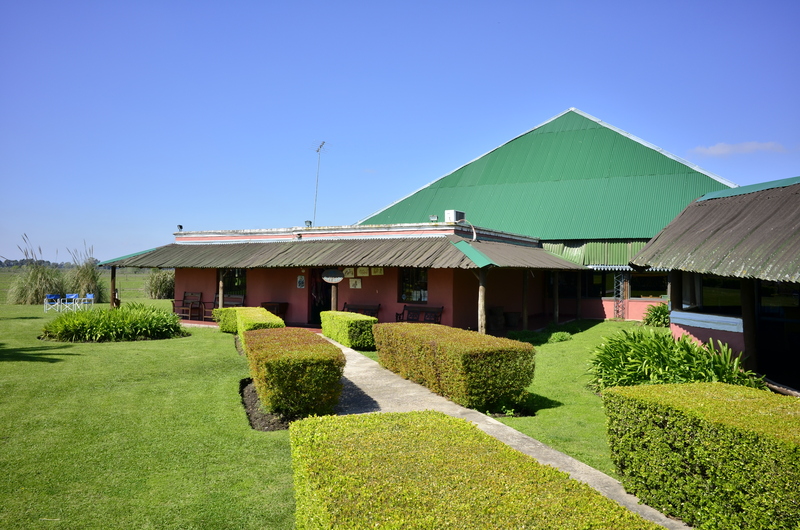 Ours is lovely–they always have a variety of delicious looking beef and pork, with some chicken. They tolerate our language barrier, and we always learn something new when we visit them. The butcher has been one of the hardest parts of language learning down here–all of the cuts are slightly differently butchered, and have a very different name! 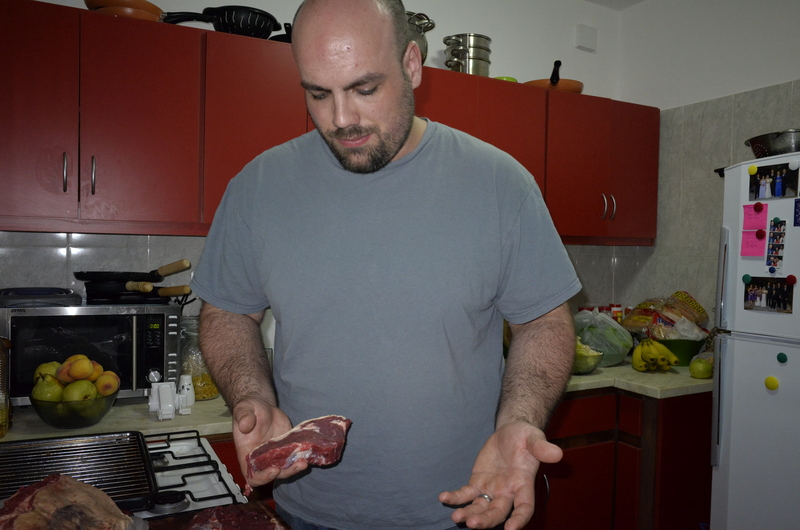 T has made it his personal goal to learn all about Argentinian beef while down here, and to cook the best steak ever. 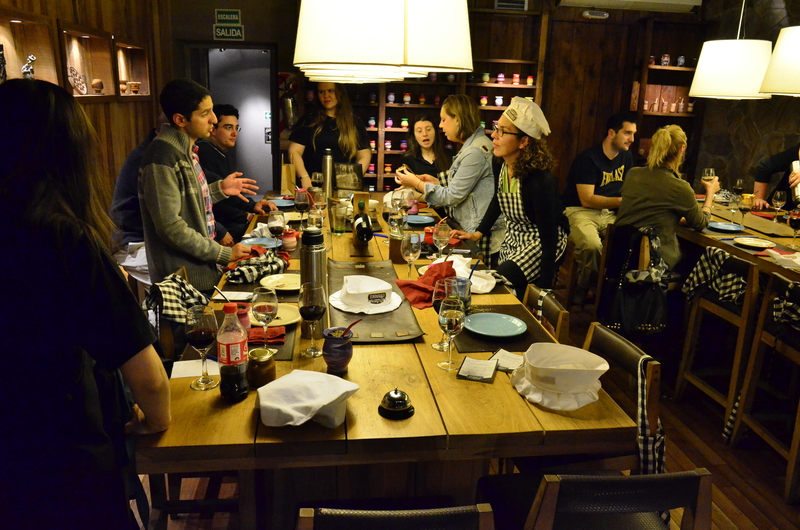 We had a great steak at The Argentina Experience in Buenos Aires, where T grilled our hosts about exactly how they cooked the meat. 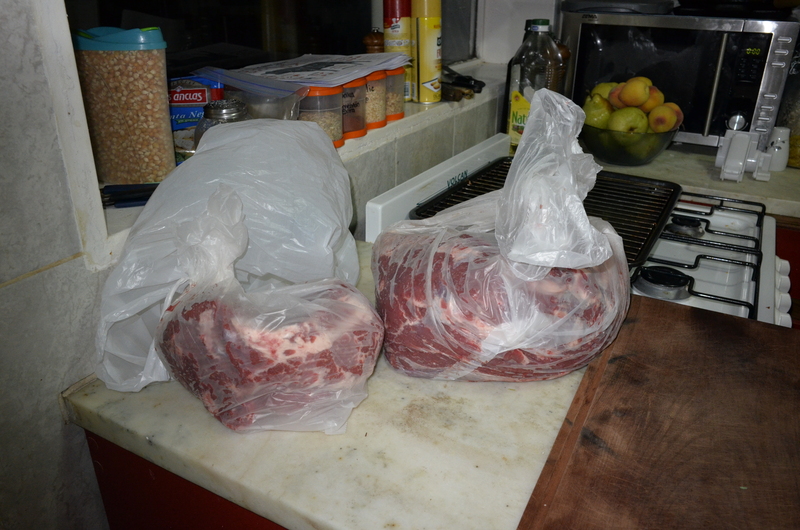 He’s determined to duplicate the process, so we decided to buy some meat in bulk the other day. 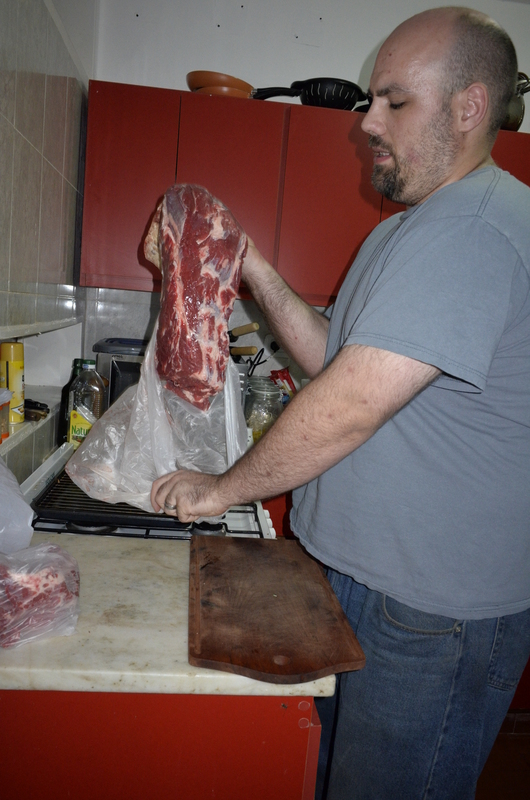 Essentially, we bought a hunk of meat as long as a cow. 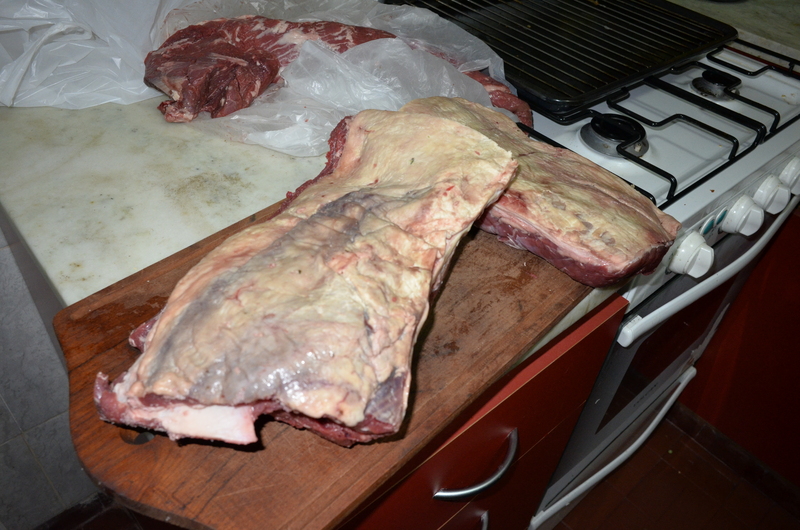 Officially, in English it was short loin 8 ribs, and in Spanish bife angosto con lomo 8 costillas. Whatever you call it, it was a LOT of meat. 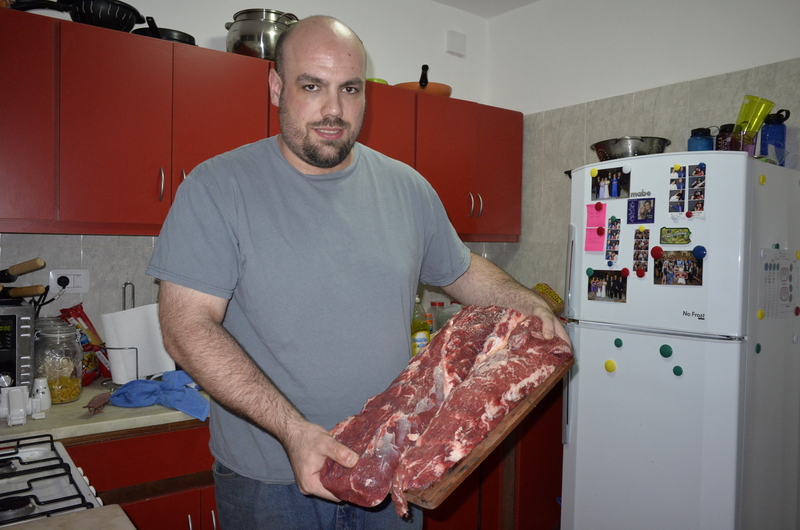 T is the resident meat expert, and has done a lot of research into not only how Argentinian cuts of beef are different from their American counterparts, but how to best cook them, Argentina-style. 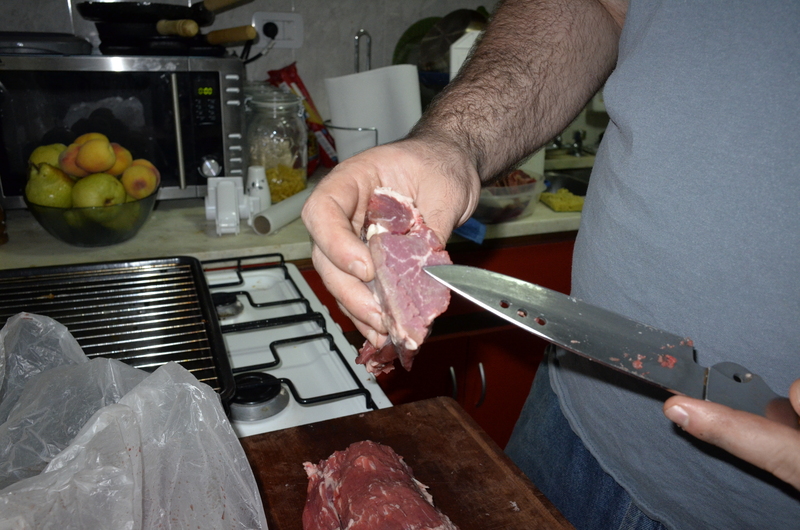 Then, T cut up the lomo, or tenderloin into smaller steaks. This is the part of the cow where filet mignon comes from–it’s naturally tender. The only quibble we had with our meat was the lack of marbling–which is almost entirely due to the fact that cows down here are entirely free-range and grass fed. No corn or sugar finishing for these cows! It’s nice that the ground beef we get is so lean (and great for our diets!) but still means a slightly less tasty steak sometimes. 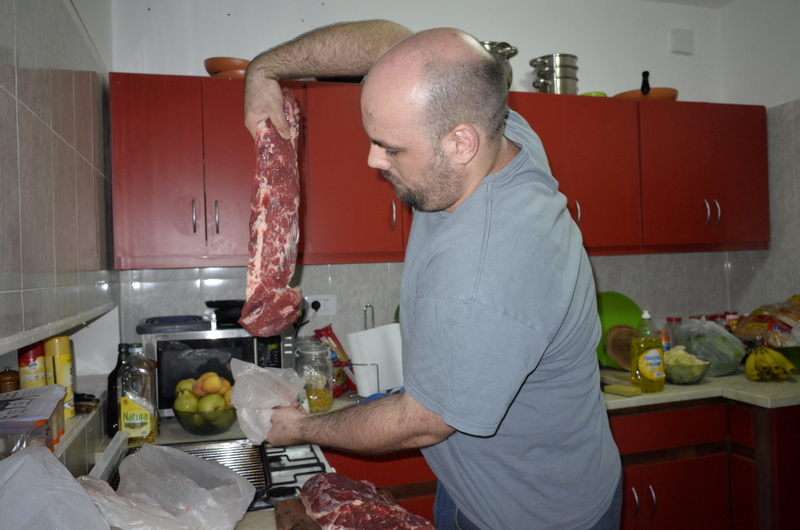 After we had successfully packaged up the meat, T took some of the lomo, or tenderloin, steaks, set them on a cookie sheet with a rack, and air cured them in our fridge for 24 hours. After that, he coated them in coarse salt, and then cooked then, 20 seconds per side, in a cast iron frying pan filled with vegetable oil until al punto, or medium rare. The result? A crispy outside with a juicy center. Delicious. Thank you, T for helping me write this post! I admittedly am not that great about remembering all of the cuts, much less in Spanish. I tend to do a lot of smiling and pointing at things that look vaguely familiar when I’m at the butcher. 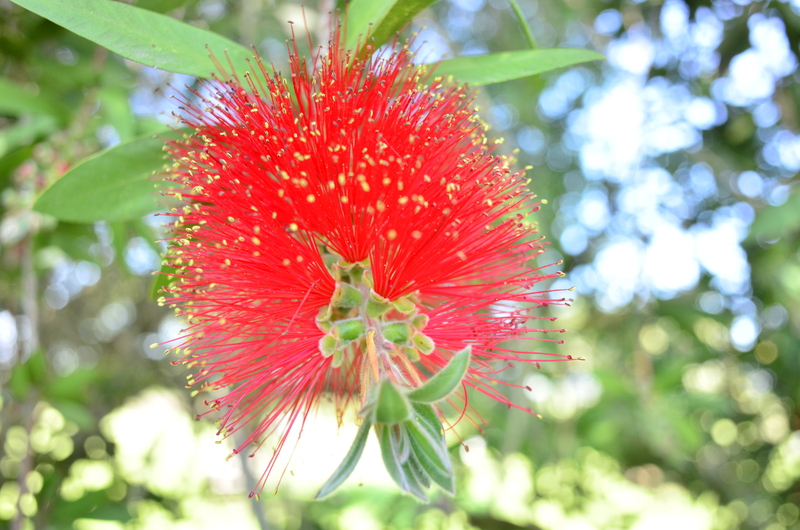 We’re looking forward to doing so many more cooking experiments while we’re down here–and hopefully we’ll remember to take photos and share what we learn along the way! We woke up this morning, went downstairs, and found this on the floor. 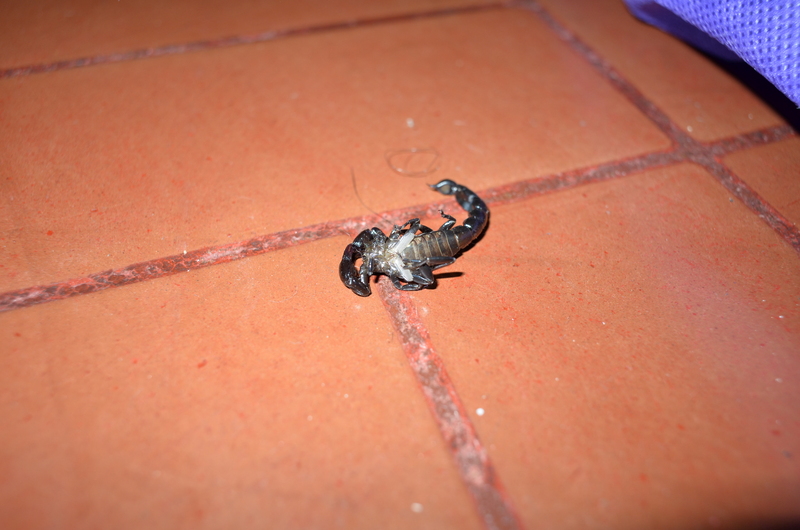 It was already dead, but I had T vigorously shake out my shoes, and then, since this is his way, he described in detail how to tourniquet and deal with a scorpion/spider bite. 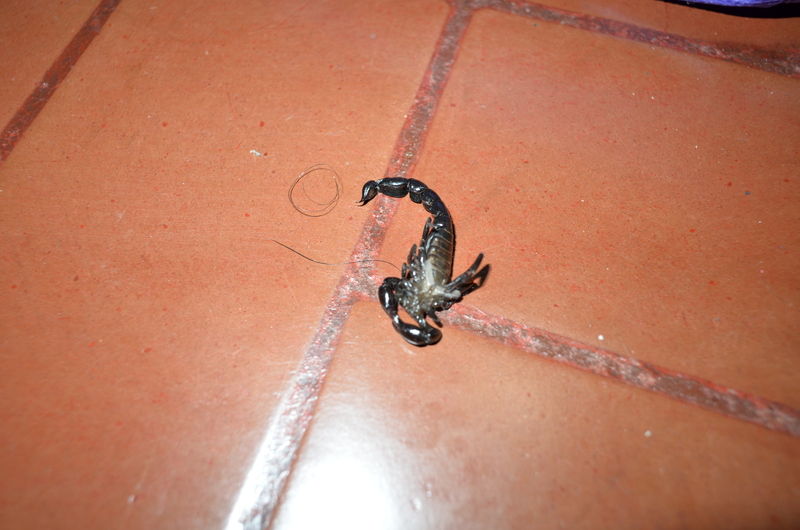 Now, our only question left is what’s in our house that killed the scorpion. 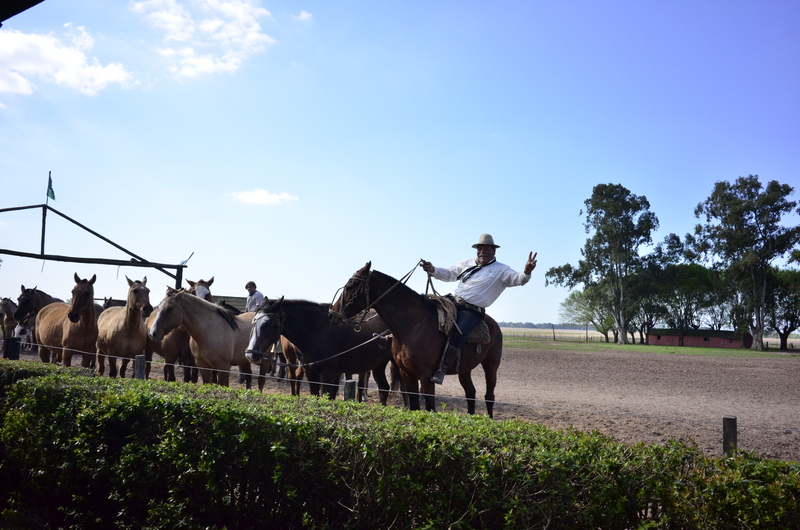 So rural that we often see gauchos (Argentinian cowboys) riding their horses on the way to work. We have more cows than people in our area. 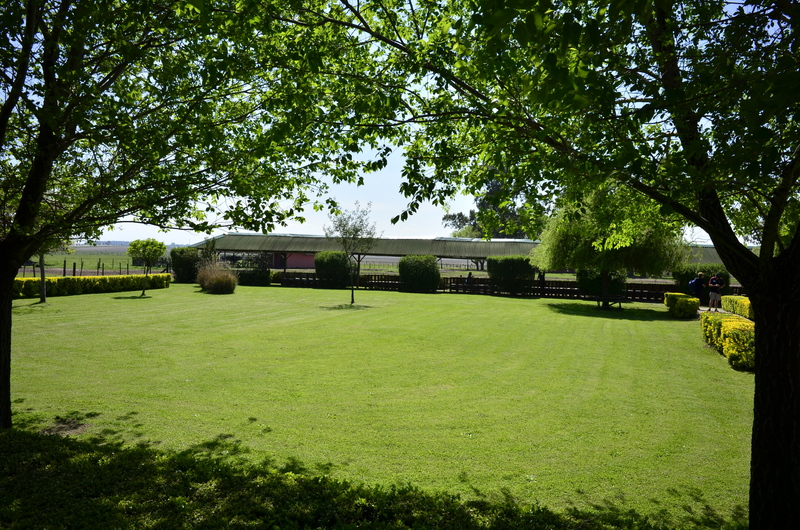 (See this post for how rural we are–we had a livestock show, and that was one of the social highlights of the town’s year.) However, it’s one thing to see them, and another to have them explain their customs to you in person. 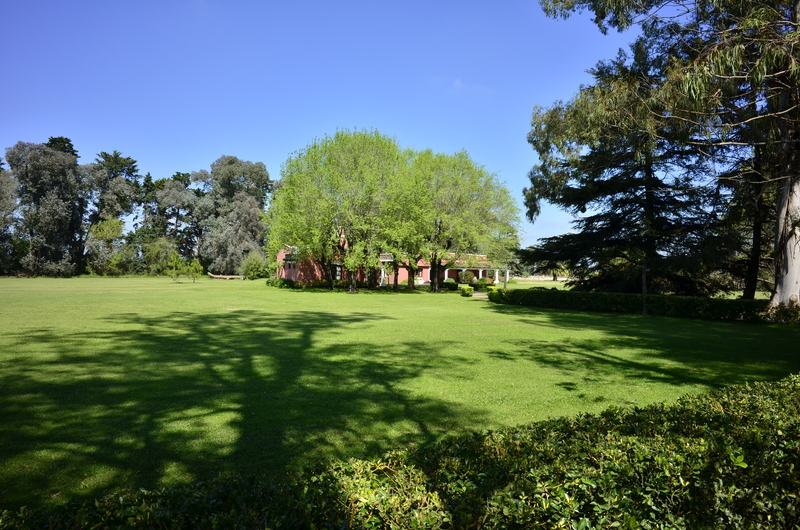 Thus, as part of our Buenos Aires trip last month, we decided to do another Viator trip and take a day at Estancia Santa Susana, about an hour outside of Buenos Aires. 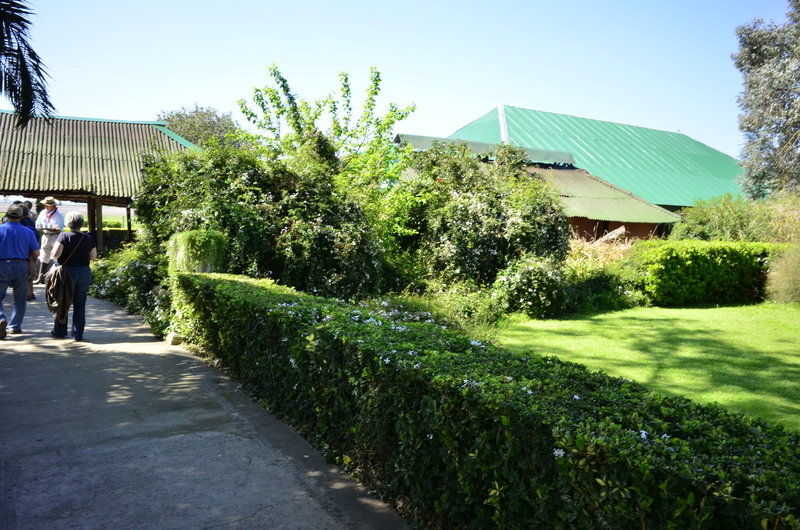 The ranch is gorgeous, in that very pampas way. 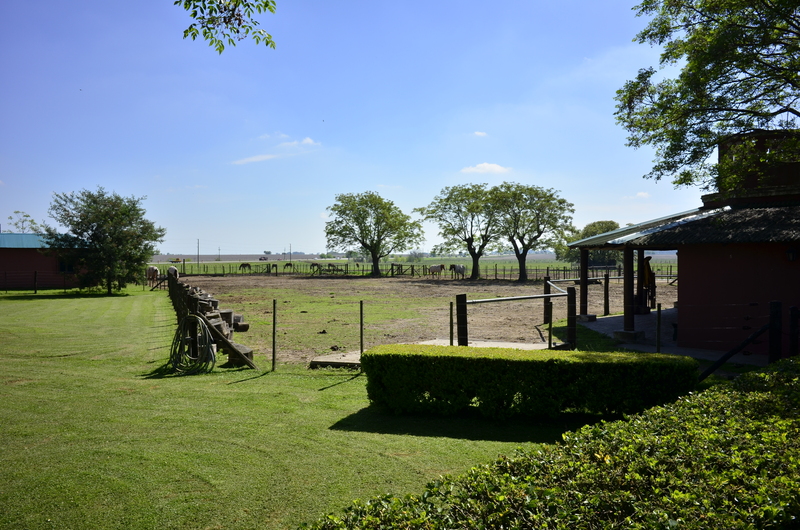 Flat land as far as the eye can see, dotted with horses and cattle placidly grazing. 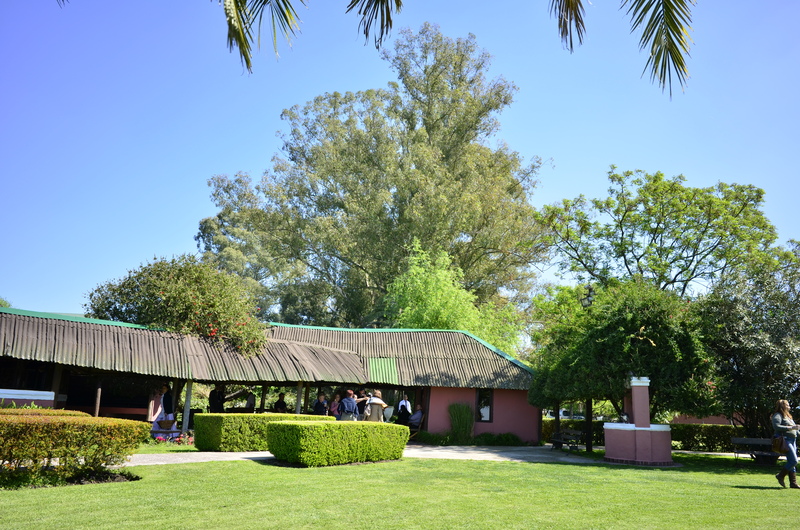 The ranch’s buildings were gorgeous, including a giant mess hall/dining room where we ate our lunch, horseback rides, a gift shop, and a huge grilling area. 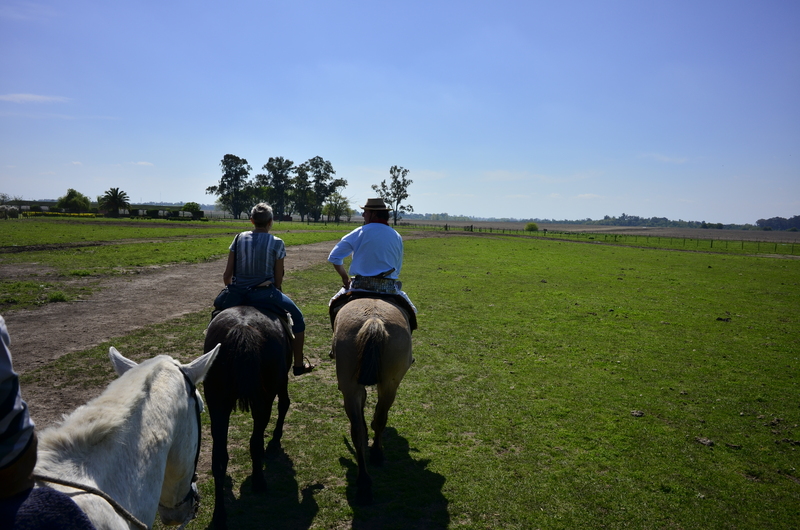 After a ride punctuated by lots of information from our guide about Argentina, gauchos, mate, and general Buenos Aires tidbits, we made it outside the city and to the ranch. 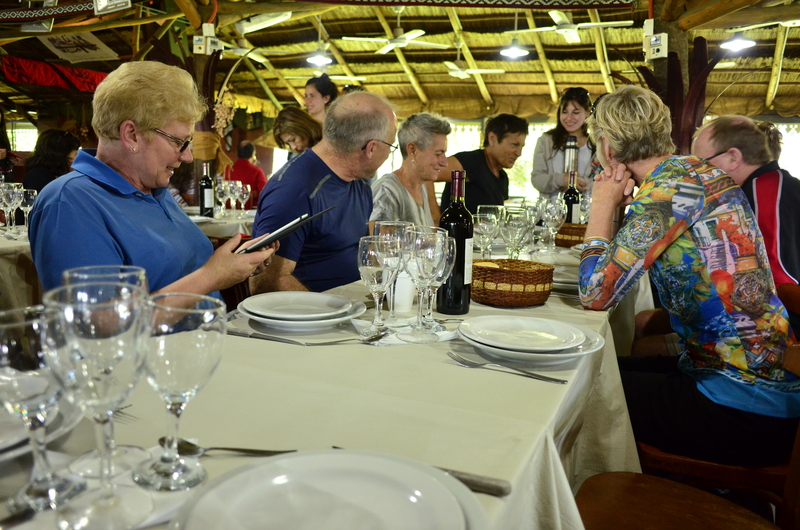 We were greeted by ours hosts, dressed in traditional garb, holding small cups of Malbec and trays of empanadas. 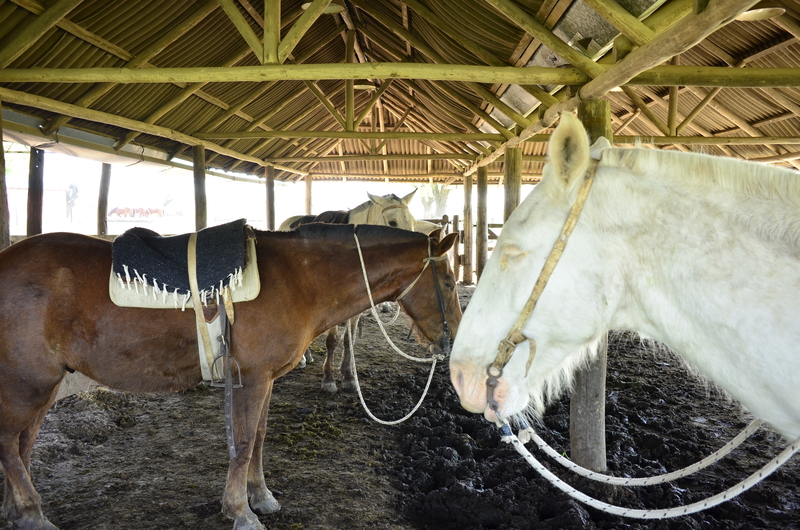 We scarfed down our empanadas and made our way over to the horses, where we could take a trail ride. I’ve taken several trail rides, and this was by far the most placid experience ever. 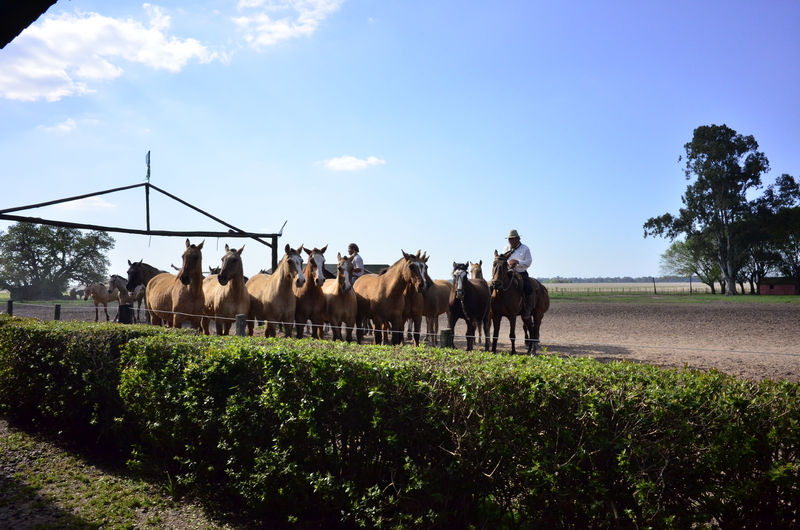 Great for those who have had hip surgery or are not really “horse people” (the rest of our group had 20 years on us at least), the horses knew exactly how to line up, and just stood there, waiting for the rest of the party to saddle up. We walked around the field, and then came back. Not going to lie, I was hoping for something a little more lively, but it was still fun. 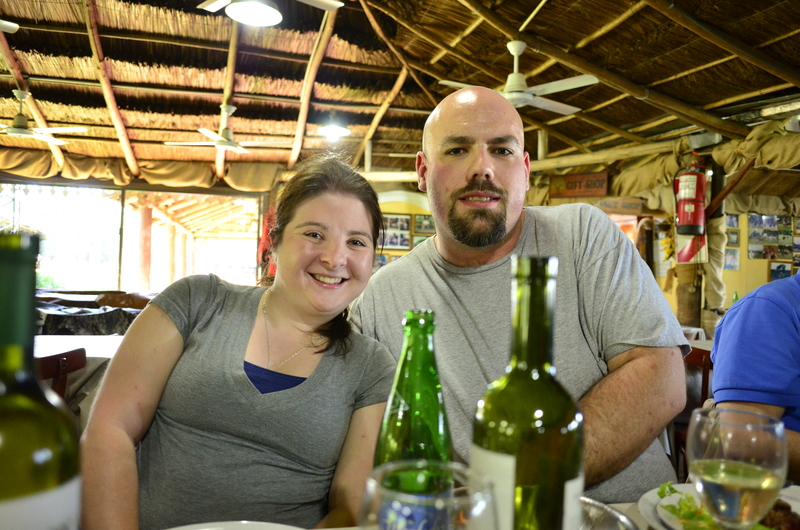 We went into the giant dining hall and were seated essentially by language group. We ended up in the midst of a sea of Aussies, Kiwis, and Scots who were in town for the Golden Oldies rugby tournament. Apparently, this group of seniors does a rugby tournament in a different country every few years. They were all incredibly friendly–but the wine and beer were endless, and in the immortal words of Robin Williams, “if you’d ever like a linguistic adventure, go drinking with a Scotsman.” We had some lively conversations about the Scottish independence vote that had occurred the day before (apparently, it was common for families to be split straight down the middle in terms of opinion on this). After the obligatory meat feast–where we taught lots of people about morcilla, or blood sausage, which is much better on bread!–they started up a song and dance show. 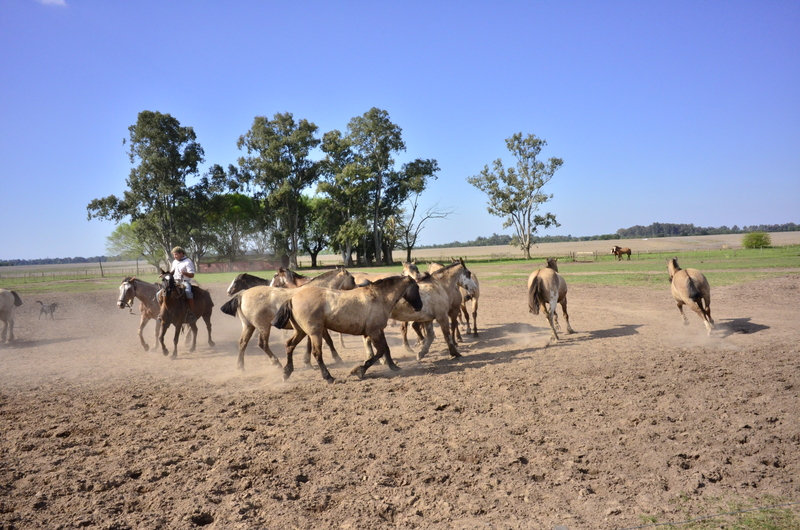 They did the usual tango dancing and gaucho ballads, and then moved into the tricks with the bolas, a throwing weapon used by the gauchos which in simplest terms are three balls tied together with leather strips that are used to catch cattle. While the gentleman threw around the bolas, he did an intricate tap dance routine. Somehow, we didn’t get any pictures of this. I think we were too transfixed (and waiting for him to hit one of the chandeliers). 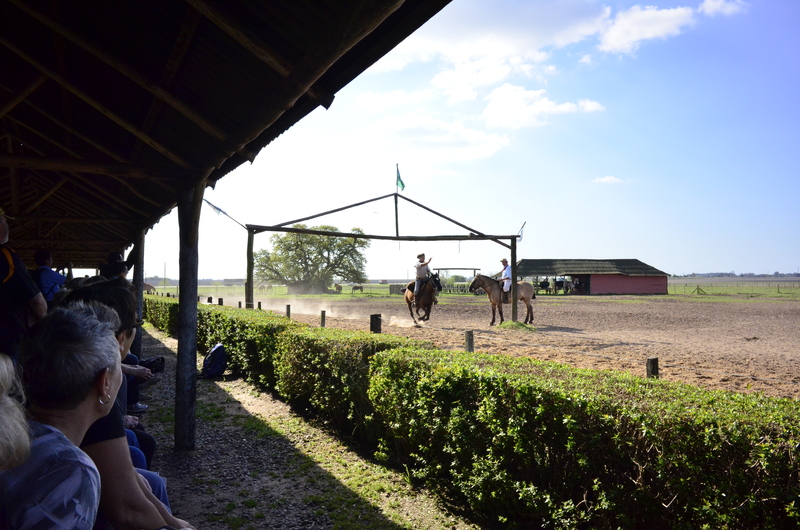 Finally, the day ended with a show of gaucho horse skills. 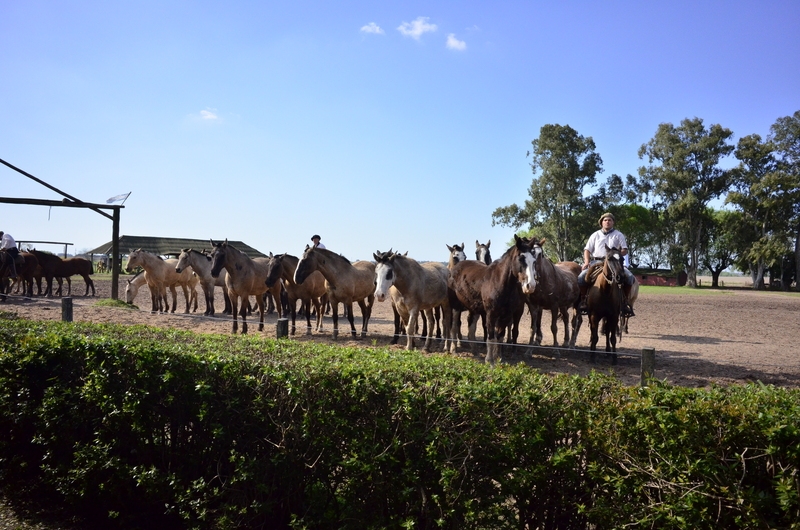 They brought out a herd of ponies, and a few gauchos expertly navigated them all around the pasture–with the help of a doggy friend. Then they did the high-speed version of the ring grab you can still do at some carrousels in the US. 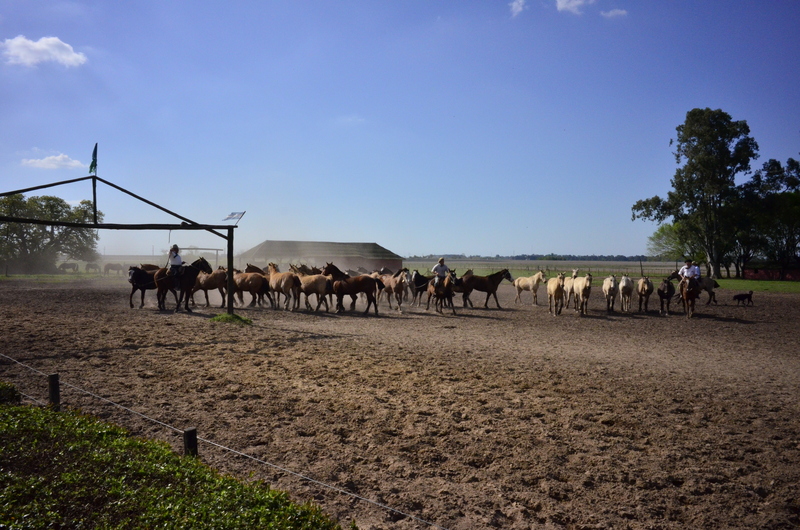 Small metal rings were placed on the top of a wooden frame, and three gauchos would race to the frame to see 1) who could get there first and 2) who could get the ring. They gave out the rings as favors–and I managed to snag one that’s in my keepsake drawer for now! 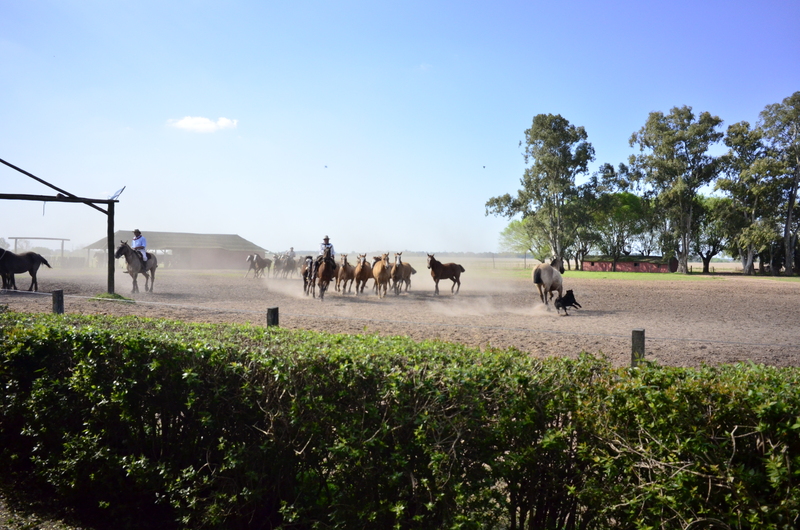 I even got to ride behind one of the gauchos and take a cantering spin around the ring. All in all, it was a great trip. We really enjoyed all of the people we met there–and it was nice to have such a diverse crowd of English speakers! 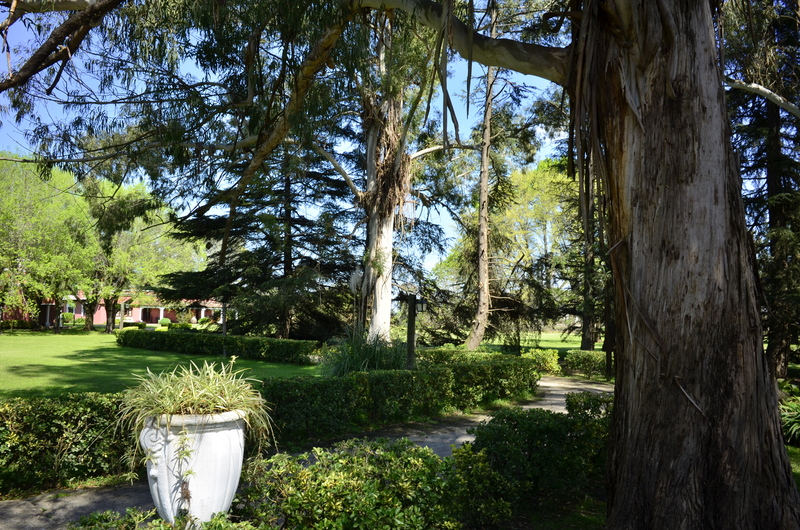 For those of you interested in a review of Viator for this trip–they did a good job. They had a van pick us up at our hotel, and then we journeyed around the city to pick up the rest of our party. 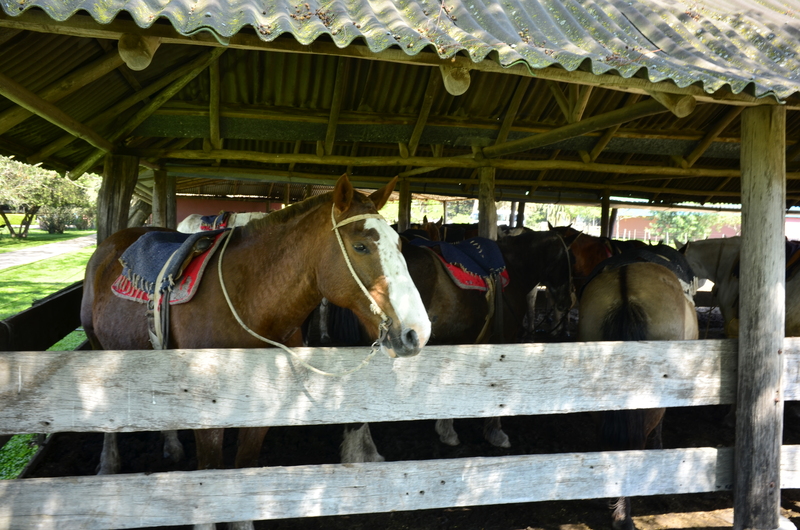 The van was comfortable, the guide was very knowledgeable, and spoke Spanish, English, and Portuguese (we had a herd of very boisterous Brazilians in our group). 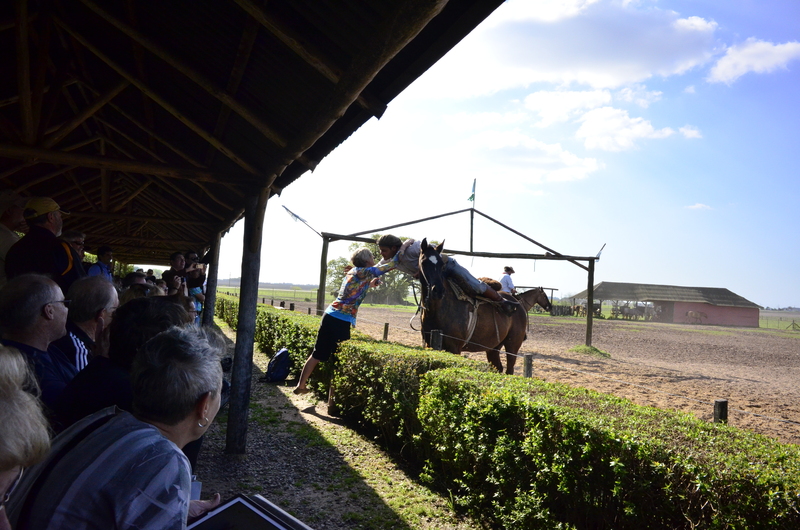 I highly recommend it if you’re looking for the gaucho experience near Buenos Aires. I’d like to put in my plug here for Viator. No, I’m not being paid to do this. I’ve just found their site, and their tours, to be super-helpful. In English (with options in other languages), you can search out activities and trips by country, city, and region. 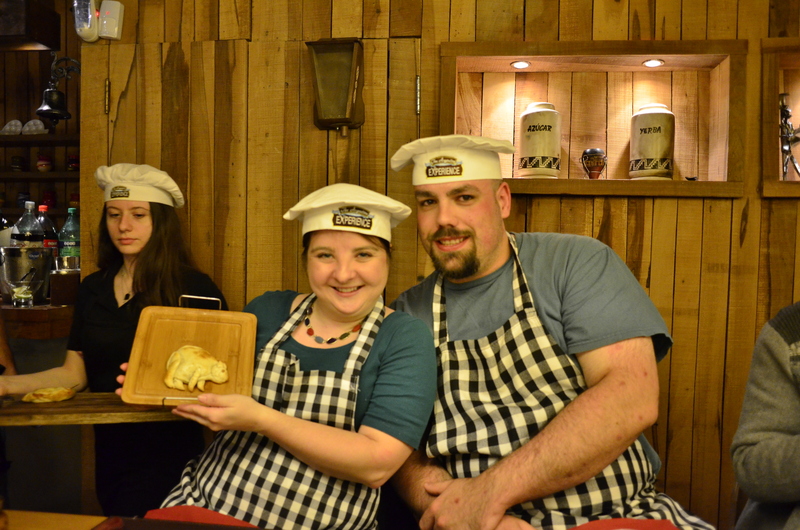 We did a Viator on our honeymoon in Amsterdam last year and had a wonderful time at the Amsterdam Dungeon and on a Halloween-themed dinner cruise. Because we were getting kind of desperate to talk in English to people, we decided to do two Viator activities in Buenos Aires. 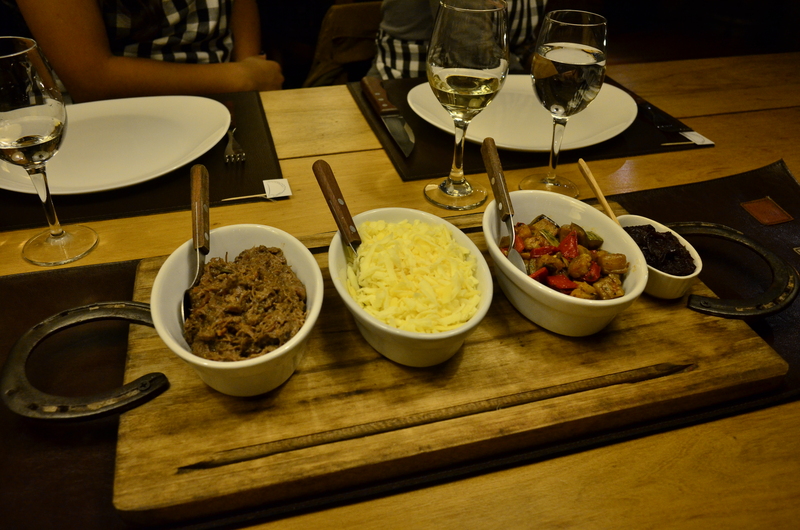 The first one was The Argentine Experience. Sort of billed as a “closed-door” restaurant, the Argentine Experience is part restaurant, part cooking class, and part fiesta. It was started by several ex-pats who wanted to find a way to teach the tourists more about how to make Argentinian cuisine, and was financially backed by a famous Argentinian poker player. 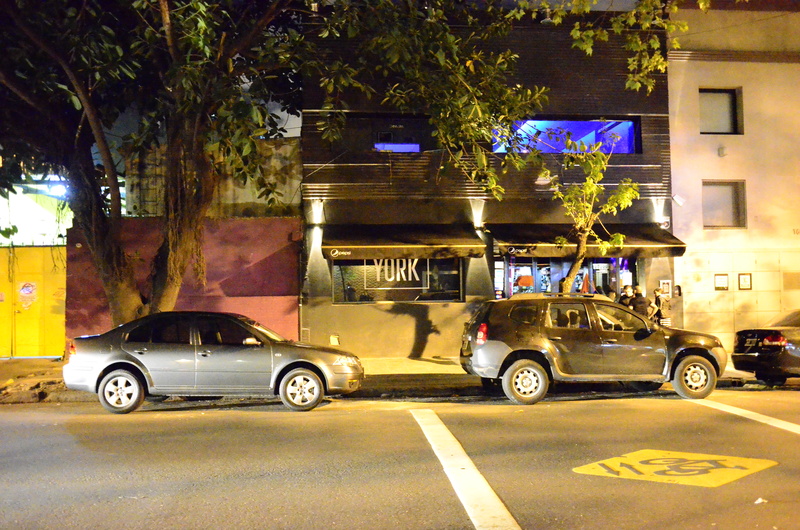 Located in the stylish Palermo neighborhood, it is a beautiful bar on the first floor for mixology classes, and a kitchen and long farmers’ style tables on the second floor. We started the evening with a delicious cocktail made from malbec and fruit juices, and the very nice staff kept our wine glass filled the entire night. Empanadas are generally translated into English as “turnovers,” although I’m not quite sure I would call them that. Empanadas are a staple in Argentinian cuisine. I think we did a rough estimate at some point and said that T and I have eaten over 1,000 empanadas since we got here in January. That’s a lot of empanadas. (They’re small–that’s why the number is so large.) If you’re unfamiliar, empanadas are pastries filled with meat, cheese, and/or vegetables. They’re generally the size of your palm, and they’re great and inexpensive street food. The tricks to having a good empanada: 1) good ingredients put into them (in our case, a beautifully marinated pulled beef, some delicious cheese, and some malbec-cooked onions), 2) filling it with the correct amount of filling so it doesn’t leak out and leaves 2 cm around the entire circle of pastry, and 3) doing the repulgue correctly. Repulgue is one of those words that has no real English equivalent. 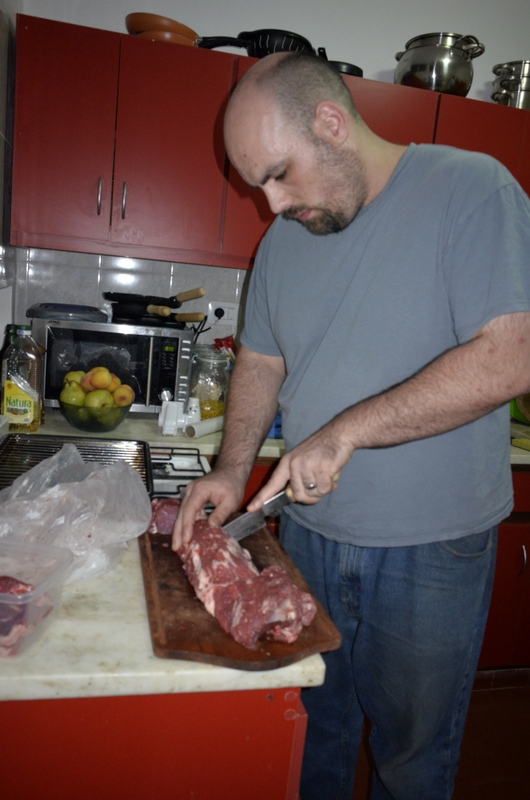 It’s used specifically to describe the action taken to seal up the empanada and get it ready for cooking. Repulgue is an art form… which I am not fantastic at. 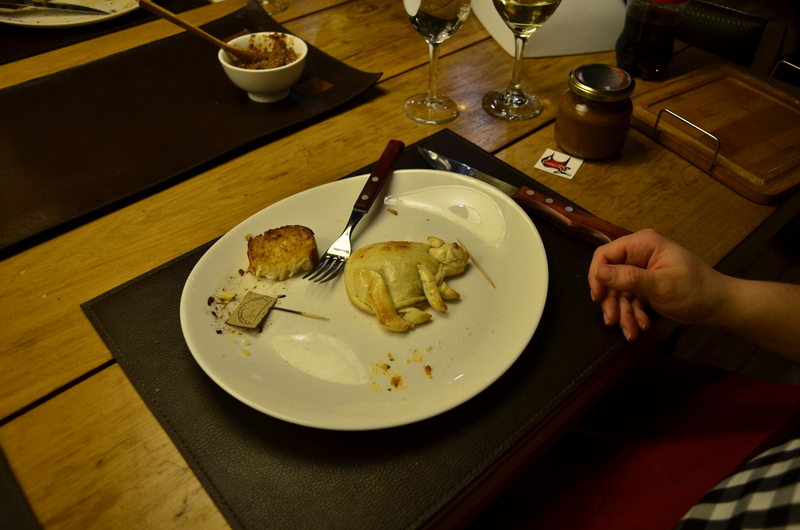 After we made our “normal” empanada (and ate a bunch of the meat and onions on their own… oops), we had the creative empanada contest, where each person had to take two pastry sheets and make something interesting with their empanada. It is well known that I am not a great artist. I do not free draw, I do not paint (unless it is a wall–I can do that), and I do not sculpt. It’s just not in my wheelhouse. Imagine my surprise when I was chosen as the winner for my “bear-pig-wombat” empanada. (In reality, it was supposed to be a carpincho/capybara, but clearly my artistic skills were lacking.) 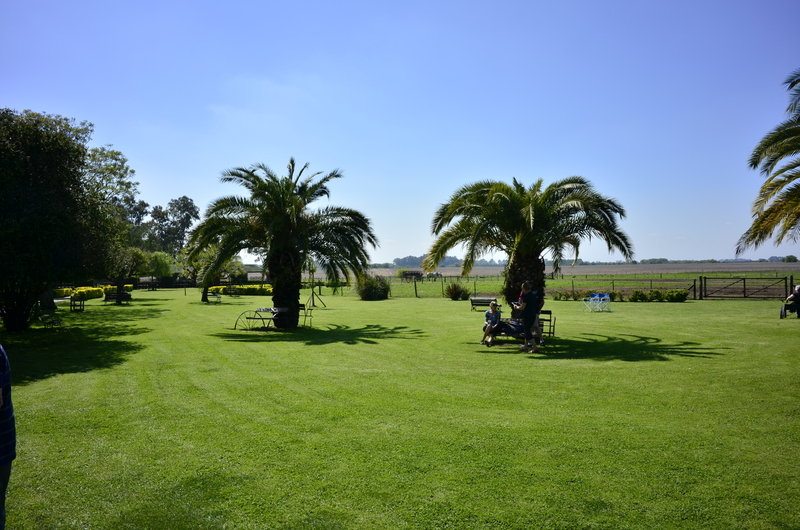 I am now a social media star on The Argentine Experience Facebook page. 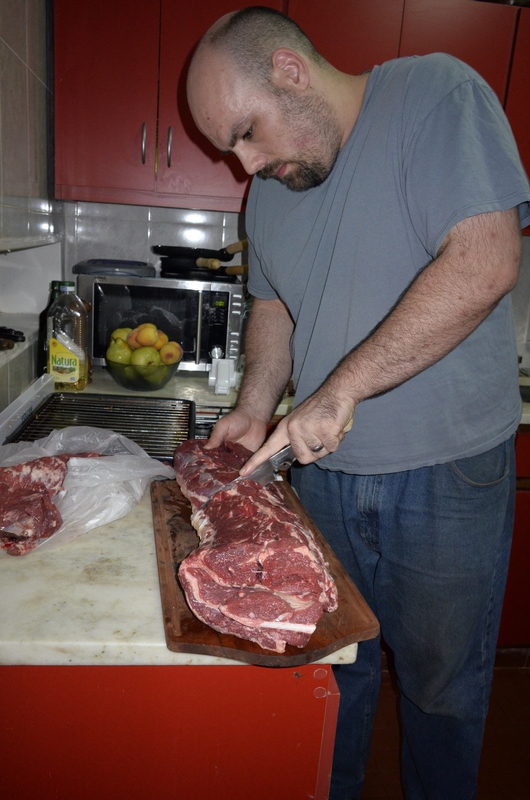 We had the absolute best steak we’ve had in Argentina–and apparently it’s all about how to cook it. They have a special method that T took copious notes on–but it involves cooking it for a long time with two sources of heat (one on either side) and minimal flipping of the meat. Regardless, it was absolutely delicious–and I’m still salivating just thinking about it. The sides of vegetables (the absolute first time we have seen steamed vegetables as a side in Argentina, ever) and the mashed potatoes were awesome. Then, on to some Argentinian phrases and hand gestures! (No, they didn’t teach us any of the dirty ones.) Basically, it was a great crash course in “things your taxi driver will probably say and do while navigating the insane traffic of Buenos Aires.” It ended with us yelling “Que te pasa!” as loud as we could. (Essentially, “what the heck are you doing?! ?” in Spanish.) It was presented with a great deal of humor–and in terms that all of the Americans could understand. Then–onto dessert! We made alfajores–which you’ll remember seeing in this blog post. Alfajores are different to every province, but the ones we made were essentially two vanilla wafers with a healthy dollop of dulce de leche in between them, rolled in coconut shavings, and dipped into chocolate. Heavenly. 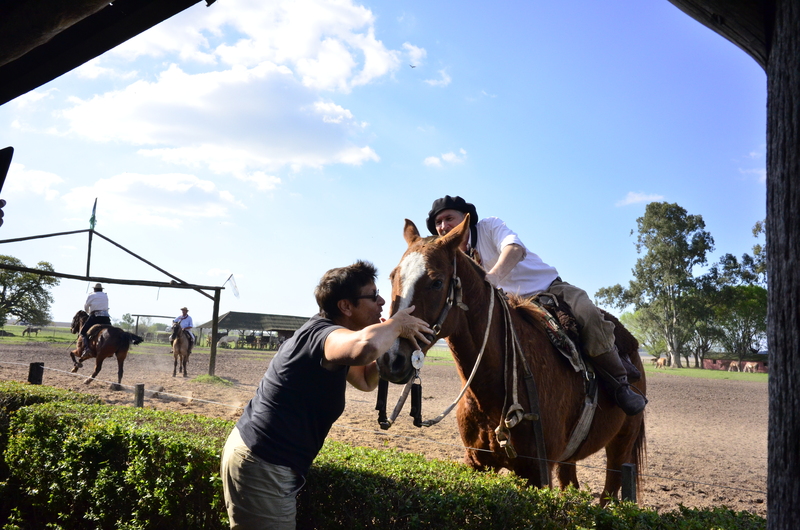 And of course, because it is Argentina, we had mate. They make mate a bit differently in Buenos Aires than they do in Corrientes/Misiones. In Buenos Aires, sugar is a required part of mate, since the drink can be so bitter. We were the only Americans who 1) knew what mate was, 2) had drank it before, and 3) had a vague idea how to prepare it. We definitely got the master class here, and drank a few delicious cups of it to end our meal! Overall: Total Win. 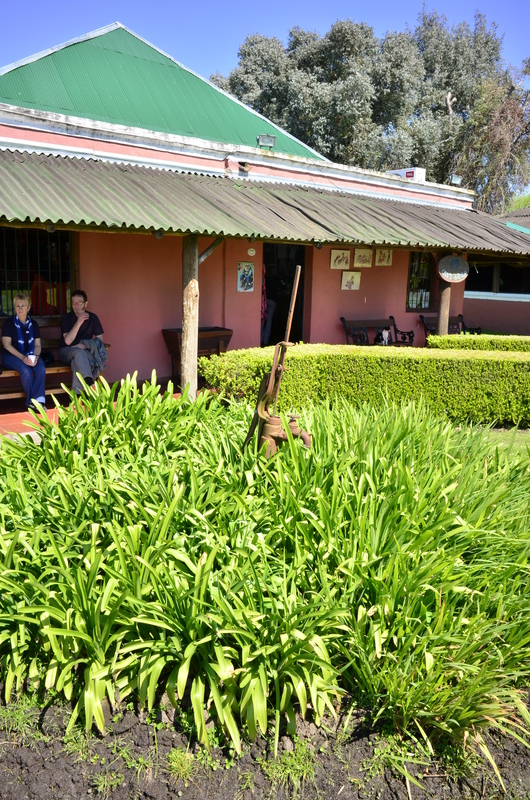 We met a lot of awesome people–both fellow customers and the staff. 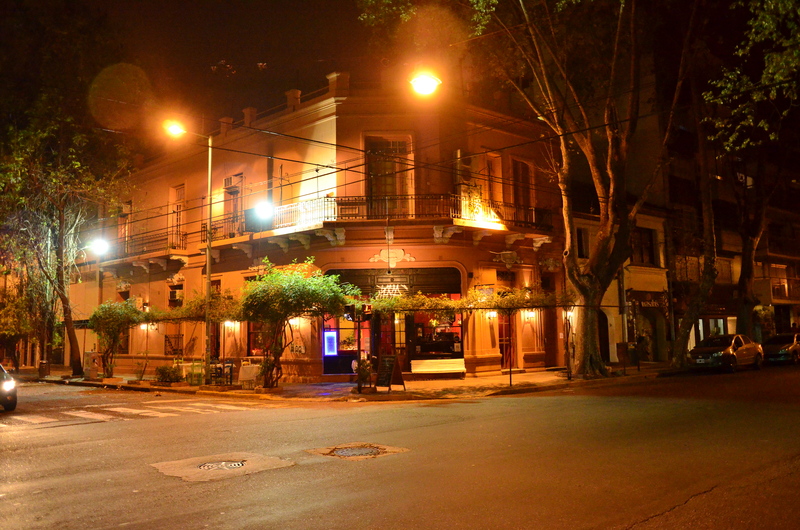 It was great to share our experience, and to hear what other people were doing in Buenos Aires–and get great recommendations from the staff about where to get the best tacos. 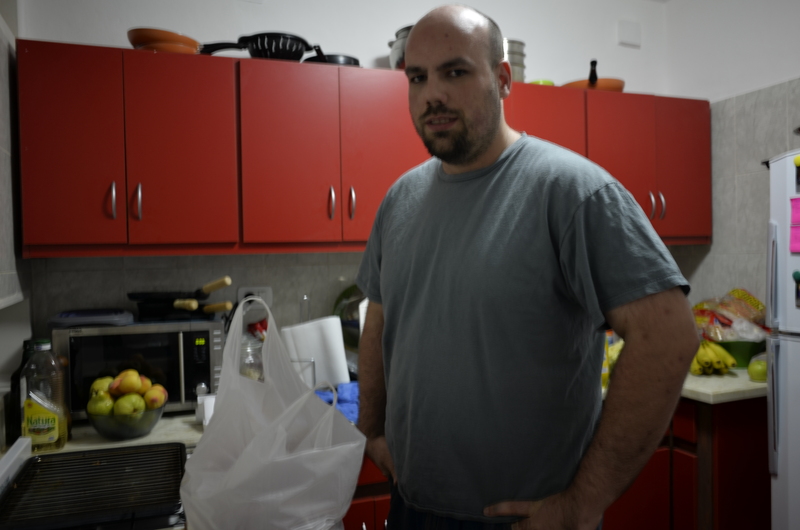 (Thanks, Fernando, for the Fabrica del Taco rec–it was amazing!) 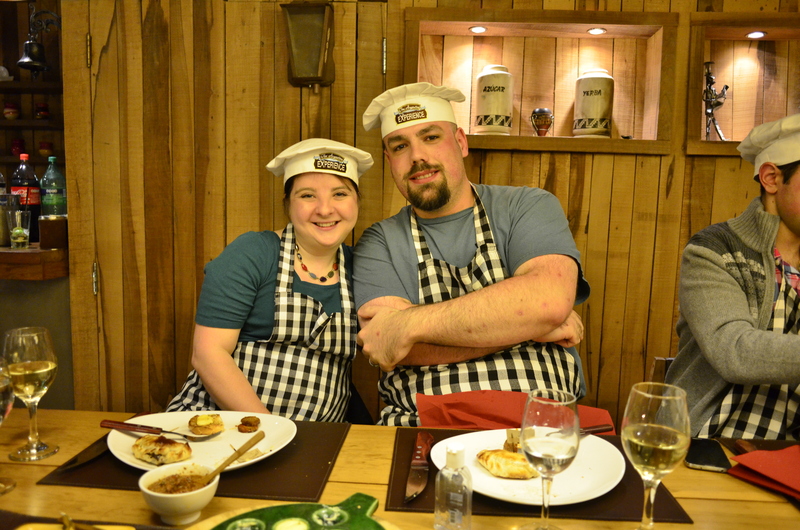 All in all–do it, especially if you’re only in Argentina for a bit and want to meet some of the great people on staff (who speak English) and learn a bit about Argentinian culinary customs. We wandered around the Palermo neighborhood a bit after our dinner to soak in the great nightlife–it’s a really hopping place, with some fantastic bars and restaurants. (It was way too early for the nightclubs to even think about being open yet–although we saw some burly looking guys hanging around outside a club called Moscow.) We eventually grabbed a taxi back to the hotel, but got caught in a sea of people who were apparently coming back from a concert, or recital. We must have sat in the middle of an intersection for ten minutes until we found a moment to keep driving! 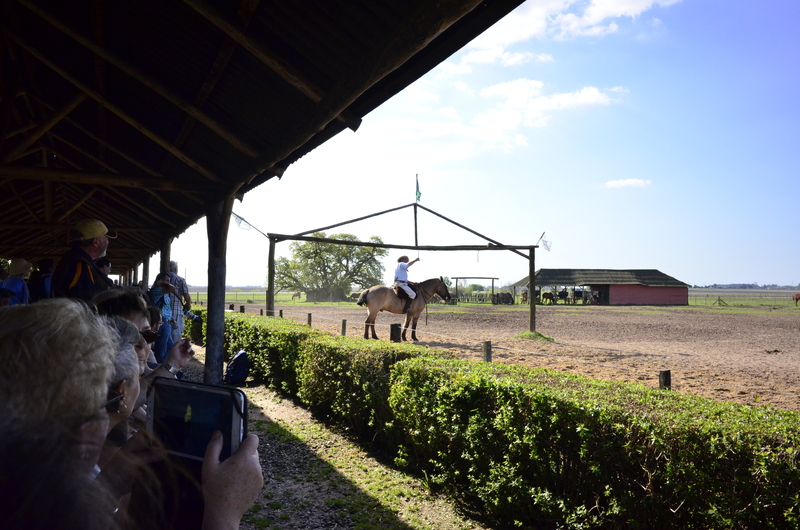 Want to learn more about The Argentine Experience? 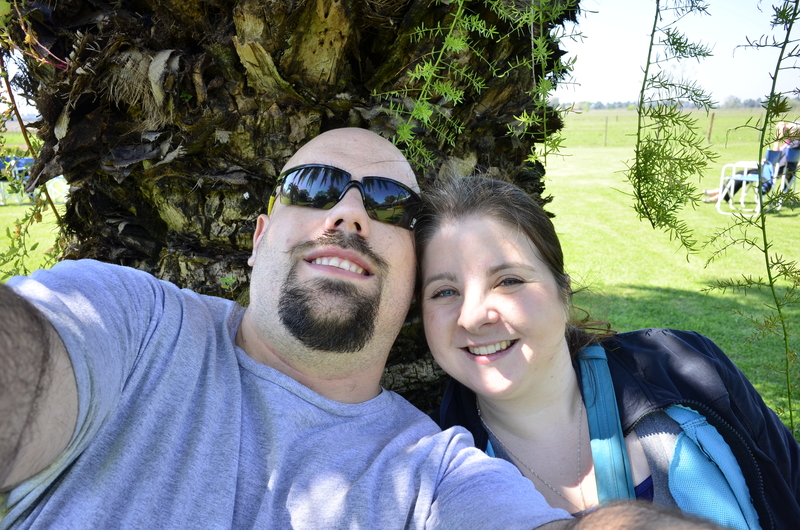 Here’s their website, which includes recipes and fun blog posts. Also, here’s the site for Viator. 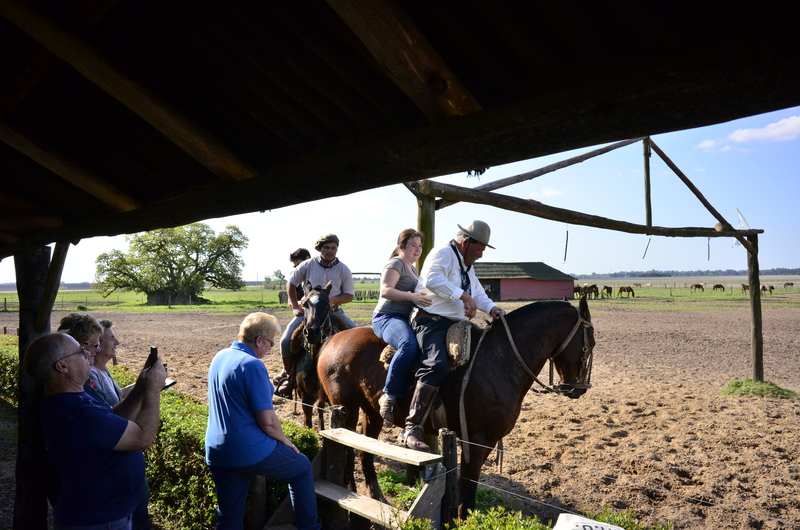 They do fun trips in lots of cities, and are a lovely way to do a structured tour or outing when you’re not entirely how to book it yourself–often with door to door service. And nope, not compensated by either of these awesome entities. 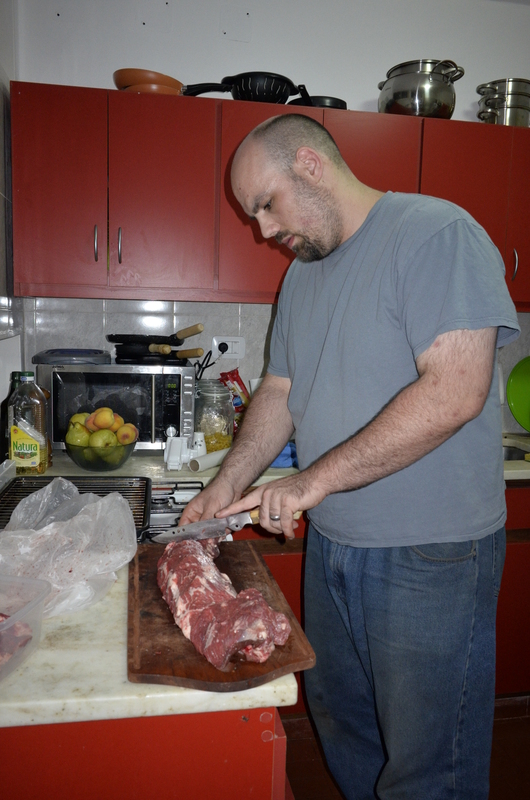 Final note: I apologize for these pictures–I do not look good in a chef’s hat, but it’s a requirement of the gig.